Have you ever wanted to learn the secrets behind creating a mildly successful, but still mostly unknown video game review blog that's pretty funny? Have you ever wanted to shake the hand of J. Wellington Rommefeller and give him free things because that's such a nice thing to do and he would appreciate it because doing so would validate his existance. Well want no more! 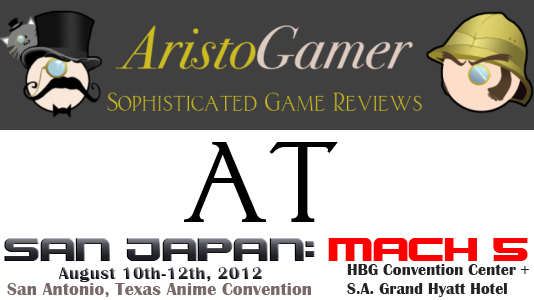 AristoGamer is doing a panel at San Japan called "How to Review Games and Be Mildly Entertaining!" Saturday August 11th at 6:30PM! Join J, Apprentice Casey and more as we share our experiences reviewing games, play games with attendees and give away free swag from SDCC 2012! 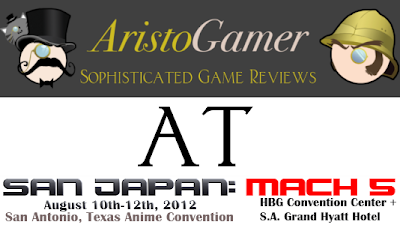 You can find the full schedule for San Japan here. And more info about the con here.